Participants of the project MEFRO met at the Mémorial du Camp de Rivesaltes and Institute Maillol in Perpignan to discuss how to improve the dissemination of memories and history among young audiences. The two-day seminar focused on the challenges faced by educational programs carried out by European memorials, highlighting pedagogical experiences and the role of sites of remembrance in the transmission of collective memories. How to transfer collective memories? What should be the role of schools and educational institutions? How do public policies can relate to the objectives of the transmission of memories? What is the role of sites of memory? 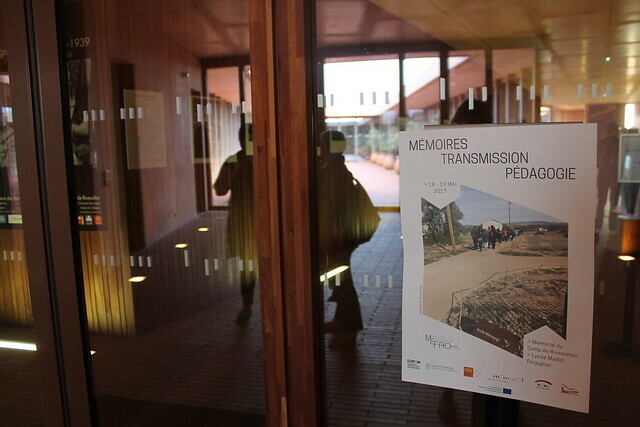 These are some of the questions to be discussed during the seminar “Remembrance, transmission and education”, organized in collaboration with the Association Trajectoires and the Mémorial du Camp de Rivesaltes in the framework of the project MEFRO, driven by the Université de Perpignan Via Domitia and EUROM. Places of memory are essential for the transmission of history and memories. Lately, those places have been facing major changes in their audiences, and consequently in their missions. National memories are not enough to explain the 20th century history from a European, transnational perspective. Teachers and educational services working on memorials feel the need to find new ways of interpellating the public, especially young audiences. Finally, emotions play a crucial role on the transfer of memories. The current lack of live witnesses, who would testify about experiences, feelings and emotions, must be filled in with alternative means of transmission. The two-day program in Rivesaltes, organized in collaboration with the Association Trajectoires, is thus an occasion to share research and questions that can contribute to the development of these issues. During the first day speakers will discuss the different approaches to education carried out by sites of memories. The second day will be dedicated to the debate of specific educational experiences and projects. Participants will also be introduced to the artistic project developed by the Association Trajectoires, a convincing demonstration that methodologies involving art can be a powerful answer to cope with the lack of witnesses of the past. Associate professor of history, PhD in letters, human sciences and contemporary history, high school professor. Responsible for the Centre for Study, Documentation and Research in History of Education at the IUFM Montpellier. Research on modalities of the elaboration of school discourses in the 19th and 20th centuries. Since 2006 he is a regional pedagogical inspector, covering academies of Poitiers, Toulouse and Montpellier. Director of the Public Establishment for Cultural Cooperation of the Camp of Rivesaltes Memorial, her aim it to carry out a scientific, artistic and cultural project open to a wide audience. Former associated artist at the National Scene of Châteauroux and director of the National Establishment of Production and Artistic Broadcasting “Le Grand Bleu” in Lille (2009). Director of the Maison d’Izieu and associate professor of History, having htaught in several French high schools and French Institutes (in Copenhagen, Barcelona, Athens, Palma de Mallorca). In 2014, he joined the teaching department of the Maison d’Izieu, being responsible for the expansion of the educational offer and international cooperation. Interdisciplinary berliner artist and lecturer at the University of Arts in Berlin. With his drawings, he animates workshops, conferences and training courses throughout Europe, basing his approach on memorial sites and biographies. He cooperates with schools, universities, prisons, museums, foundations and television production companies. PhD in Contemporary History, specialist on the war of Algeria, she is co-founder of the Harkis Association and Human Rights. Member of the Board of Directors of the Seligmann Center at the Citizens Foundation, of which she was awarded the Anti-Racism Prize in 2005, and of the Scientific Council of the Memorial of the Camp of Rivesaltes and of the Maison d’Histoire et de Mémoire d’Ongles. Photographer, she is involved in various artistic and aesthetic projects. In 2005 she began a long study on the Camp of Rivesaltes by establishing an important photographic collection and acted as “surface archaeologist”, collecting also the objects found at the camp.